I thought it would be a bit remiss if I didn’t mention on my own blog that I gave a talk about the benefits of blogging! The context was an annual conference called Civil Service Live. An event where thousands of civil servants gather to hear the latest views and ideas from all around the service. This year speeches included a variety of Cabinet Ministers, and panel discussions were facilitated by some familiar faces, including Peter Jones (of Dragon’s Den fame) and Kevin McCloud (didn’t catch his session unfortunately – on eco home design of the future). I saw an inspirational talk by Professor Eddie Obeng (member of the Design Council). He showed us a short film: the World after Midnight – which illustrates how it is not enough any longer to tinker around the edges with systems and services – the world has changed, and we need some radical changes to reflect that. On to the session I took part in. The format was one of a general introduction, then 5 groups where myself and different colleagues spoke about different parts of the social media toolkit: blogging, photos, video, twitter and social media monitoring. My main conclusion would be one of optimism. A session at last years conference saw a small group of people who already knew about what was going on, mostly talking to each other. This year, the session was held in one of the big lecture spaces, and was packed. I didn’t count heads, but I reckon well over 100 people were there, as at least 25 were clustered around my table. My main message was how blogging in a work/government context can bring a personal perspective to what goes on. Especially at the moment, when civil servants and public sector workers more generally are in the news more than any time I can remember, there is still very low knowledge about what people who work in Whitehall actually do. I spoke about what we are doing at DFID as DFID bloggers have some fascinating stories to tell about their work all around the world, but I also gave some pointers to other established blogs around Whitehall – FCO and MOD for example. There were lots of questions – only 2 people in the group had ever commented on a blog post, and I think only 1 or 2 had ever written their own. We discussed a process for setting up and measuring the effectiveness of a corporate blog, but also the value it could bring to individuals who could write about something they feel passionate about and find other people who share similar interests. As I said, I left with a feeling of optimism that more people who work in the public sector are curious about these tools – which don’t feel new to those of us who use them every day, but which are still a big step for people used to traditional methods of communication. At least 2 people asked me for recommendations of which tools to use – so I hope we see more people trying this method of showing that the civil service is not some army of faceless bureaucrats, but a diverse workforce with many different faces. ps. It would have been nice to illustrate this post, but I don’t have any photos of my session. If any of the people who were recording the event has something appropriate and can contact me, I’d appreciate it! This years theme: world leading technologies changing Africa. A line up of 16 speakers which explains why I am sitting in a windowless lecture theatre on one of the hottest days of the year! 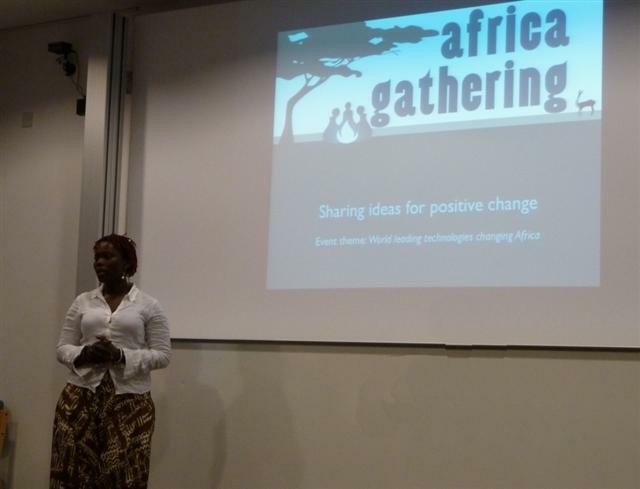 To explain – Africa Gathering is an event that facilitates people getting together to share their experience and great ideas. I attended last year, and am still quoting some of the stories I heard there. This year its in the Cruciform Building in UCL – a huge victorian red brick building – as the name suggests, in the shape of a cross. Inside, there are acres of glossy tiles and interesting archways, but the lecture room is like a thousand others. As mentioned – 16 speakers presented either 10 or 20 minute sessions – I’ve attempted to capture a flavour of what they said below. The main ingredient which links the all is enthusiasm, which spills out and washes around the room, the most obvious evidence of which can bee seen in tweets of the event. Search #aglondon to see more. Clifford Furguson – community cooker. Another ingenious community idea – build a facility that runs on rubbish. People ‘pay’ to use it by bringing their rubbish (result – community cleaner, health improves, environment better). Community involved – jobs for the people in sorting the rubbish, feeding the incinerator, some materials are recycled. One exists in Kibera, Cliff’s project (community cooker II in Magongo) will innovate by adding a community bakery – as the cooker is on 24/7, used for cooking normal meals during day, and bread is baked during night, for supply to local hotels. Water collected by rainwater harvesting, heated by cooker – facility also offers showers and bio-toilets. Pamela McLean – Dadamac. UK/Nigeria collaboration – both a limited company and a foundation, which enables them to run projects both commercially and as third sector. Skilled in making links between people and communities. Richard White – Dakar Dragons. Empowering African business women. Richard started with the old adage: give a man a fish…. well, his project goes one step further, and aims to encourage people to set up a successful fishing business – not literally, but following the model of the adage! He visted Senegal and the Dakar Dragons project aims to support the work of the 10,000 girls project – which itself aims to put 10,000 girls through education. The dragons look to facilitate women in business, not through cash handouts, but by setting up mentoring partnerships and providing leadership challenges. During his visit, he also saw the work of the Synapse centre and pointed to this is an inspiring model to adapt. Rose Shuman from Question Box – technology is definitely cultural. Her idea aims to address the challenge of getting information to people where the culture is verbal, and low levels of literacy shouldn’t be a barrier. Question box is simply that – a box on a wall with a green button – users press it to make a call to an information centre, where someone who speaks their language will try to answer their questions. Back at base, the person has a computer with access to local databases. Great example from their analysis that in rural India, men used question box 7-70, women (girls) just 7-14. As box is in public place, girls stop using it once they grow up. Possible solution – women only question boxes – pink paisley and situated in rooms where women could congregate. Also – pilot in Uganda which was set up as an agricultural answer service, people have insatiable curiosity, and questions went way beyond those about crops and livestock. David Aanensen – epicollect. An academic whose area of research is using computers to aid understanding of epidemiology. The platform they developed: Epicollect.net aggregates data collected in the field onto maps which track what is going on where. Sample projects – MRSA distribution across Europe, and tracking a fungus that is infecting frogs around the world. Smartphones used for data collection. Central website collects, displays and filters data. Their tool is completely free and open. Google cloud used to store data. Live demo showed literally seconds to create a project and form for data collection. Adrian Scarlett – Zambezi international school. Wants to empower local people, building on a ‘green school’ model from Bali – school built of sustainable materials and employing local people. He and his wife intend to relocate to Africa to bring their project to life. Thibault Jamme – open source and opportunities for Africa. For those who haven’t come across the term open source, is it any good? Thibault explained very clearly “yes, it is!”. He also handed out ubuntu keys – good example of how it really is free! Also very useful in Africa – can put the key in an old PC and it will work – much less demanding system than windows. Plus, offers opportunities for people in Africa to develop their skills and sell support services. Ben White – one of the people behind Africa interactive – Africanews.com – pan Africa news network. But, here to talk about Afrilabs – entrepreneurs and investors. Inspired by spending time in Kampala – seeing a whole generation of young Ugandans who are comfortable using the web – creating content, coding etc. His wish “if only I had $10 million, I could fund so much”…. so set about working out how to leverage venture capital, worked with organisations such as Hivos who fund the iHub – similar labs are now springing up all over Africa – LimbeLabs, Bantalabs etc. Afrilabs is a new network which brings together all these labs and similar organisations, to encourage collaboration, sharing ideas and generating investment. VC4A (Venture Capital for Africa – new website launches next week) is an online community of investors – started a year or so ago, and there have been many meetup all around the world – barcamp style, entrepreneurs meet investors. Alan Jackson – Aptivate.org an NGO which provides IT services for development – including projects like ‘loband’ which squishes websites for people in low bandwidth areas. His presentation involved the audience – discussing questions like: what is participation? is it good or bad? (good response – participation in a bank robbery is not a good thing….) what participatory practices would be helpful in an IT project? what benefits would the participatory approach offer for you? Conclusion – “if you don’t use your It project to foster participation, you’re missing an opportunity”. He then went on to say actually, you can replace the word IT with ANY type project – participation is a good aim in itself. Will & Fran Perrin – The indigo trust (one of the sponsors of this event). A fairly new grant making organisation, which focuses on fostering access to information. Michael Jenkins – metaLAB. Aim is to give African youth the digital know how and digital resources to discover life services, live life differently etc. Be smart = Bsmrt. MetaLAB are for profit social entrepreneurs – invest using market principles. morathomedia is an African company that was set up for creative and media production services professionals. E1M is Everyone mobile – content distribution and media managers. All work together – big vision, focus is on free pan-African social learning network. Case study is Mxit – free instant messaging platform, that many African young people spend a lot of time on. Bsmrt on Mxit – offers lots of opportunities. Unscheduled speaker (didn’t catch his name) – shared info about 2 web platforms – Hosafa an events listing platform for finding out what is going on anywhere in the world about Africa, and wowsociety – an idea that the best way to help anyone, is to find out exactly what sort of help they need, and how they would like to be helped. Its beta at the moment, but if the enthusiasm of this speaker drives it, then it deserves to succeed! Tag McEntegart – INASP, talked about Authoraid – supporting developing country researchers in getting published. INASP is the international network for the availability of scientific publications. Its been around a while. If were to change the name to reflect current work more accurately, would be the same acronym, but a=access, and s-scholarly – wider than scientific. Growth in quantity of information available means that human guides/maps/filters now much more sought after. Principle behind AuthorAID – matching mentors and mentees (common themes emerging here – INASP and Dragons!). Project aims to increase the success rate of researchers in getting research published, and to increase their visibility in international journals. Interesting point – site is seeing an increase of visitors via mobile phones. Gbenga Sesan – Paradigm Initiative Nigeria. Talk called “Business unusual” – lively speaker who openly admits technology has transformed his life. Very optimistic about the opportunities offered to Africa as internet access improves. Also talked about cybercrime – MISSPIN – microsoft internet safety security and privacy initiative for Nigeria – working through ambassadors to get things done in communities, cyber cafes and schools. Gbenga is especially pleased wen young people who used to be involved in cybercrime are transformed and use their IT skills for legitimate profit. Have a look at the Ajegunle initiative. Kevin Allen – Known as Banana Man in zululand, because of the charity work he does there, providing food for children. Set up a scheme which provided hundreds of thousands of school meals, then evolved to a charity – which now does much more. Alasdair Munn – Member of Environment Africa – moving from Aid to trade. Finished the quotation – “… teach a man to breed fish, you build a business, sustain a community and ensure the survival of a species”. Talked about Campfire project in Zimbabwe – community sharing in the income generated from their local resources – problems due to lack of community ownership, and highlighted the Hwedza community honey processing project – which is good at producing honey, but lacks access to markets. New focus is on PPCP – public private community partnerships – all about corporate social responsibility and sustainable development. Case study Songo project – in Zimbabwe, around Lake Kariba. Partnership between private game management company, Environment Africa and local community (who own 26% of new company). Final words – Africa Gathering carries on and is spreading. There are lots more events planned – not just in UK and US, but across Africa. They are also starting a fellowship programme and looking for ambassadors – anyone interested, keep an eye on their website.